I have heard this verse TWICE today, from two different speakers. I think the Lord is trying to get me to pay attention to it! When we are discouraged, when we are lonely, when we are down, when we desperately need *something* . . . the Bible tells us to encourage others! Refresh someone today! 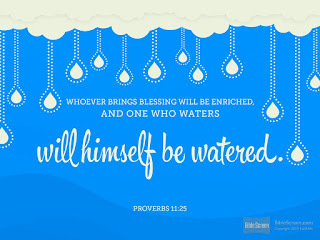 It will encourage them and be a blessing to YOU!